Over the past few weeks, I’ve been testing V-Ray Next GPU on just one 1080ti and this is the result of these experiments. The speed is obviously a huge improvement on the CPU (and on older V-Ray RT running on the GPU). V-Ray Next has also made a huge jump in the number of core V-Ray feaures it supports on the GPU (and in the IPR), which makes it increasingly hard to justify rendering on the CPU alone. I still miss textured environmental fog, the curvature map, and 2D displacement, but apart from those, I now see very little downside in working on the GPU for final renders now. The remaining cons are known and essentially revolve around having to fit the scene in the card’s VRAM. Clearly, when you’re used to working with 64GB, moving to something like 8GB (Windows 10 eats up a few GB of VRAM on my 11GB 1080ti) requires quite a lot of discipline. In this scene, I decided against using any form of render-time displacement. After many tests I found that either the displaced scene didn’t fit on my card, or I had to reduce the quality settings so much that it was no longer convincing. Also, preparing the scene for rendering slows down a lot when using displacement. Instead, for things like the walkway, I displaced the mesh in Max, decimated the result, and used a normal map to get the finer relief. I also tried to keep most textures to a maximum of 2K instead of my standard 4K, except for those, such as the bricks, that had to be very fine. The HDR map is also very low-res. This saved VRAM and made no appreciable difference to the final quality of the pictures. Speed-wise, these were rendered with environmental fog at 2K in between 30 minutes and one hour on a single 1080ti and the CPU using hybrid rendering. This is considerably faster than what I’m used to on just the CPU. I used the in-house denoiser for a final polish because the Nvidia AI denoiser tended to wash out my roof tiles, essentially mistaking the fine geometry for noise. The denoiser was useful when pushing a 30-min render over the finish line. By waiting just a little longer, I would reach my noise threshold and the final image would be clean enough not to need any denoising. The most problematic areas when rendering were the spots where V-Ray lights (spheres and planes) illuminate the fog. These were pretty noisy and tough to clean up, as you’d expect if you’ve used environmental fog on the CPU. I may put this scene up for sale once V-Ray Next is officially out. I’ll post again once that happens. It could be a good test for a GPU set-up, and it has some interesting assets in addition to the building, including the scanned walkway and road and a set of detailed scanned dead leaves that are great for scattering. Below is a little animated GIF showing some stages of the scene building and look development. 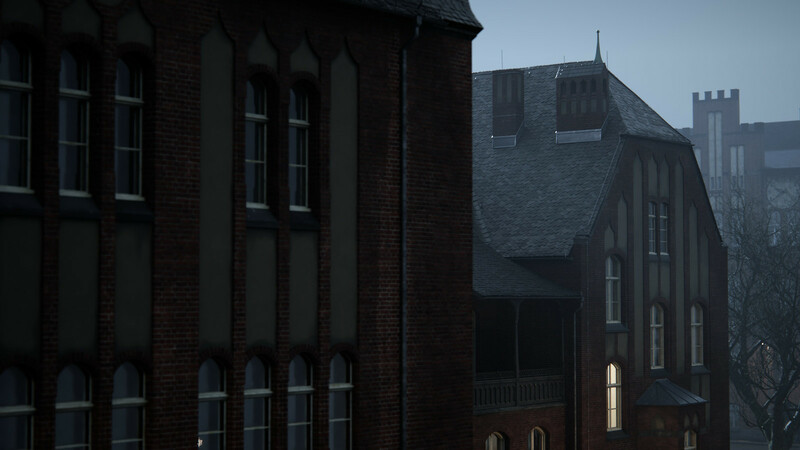 And finally to wrap up, a little bonus about how I went about modeling this building. This is an existing, 19th century structure that happens to be on the campus of the Charité hospital in Berlin. 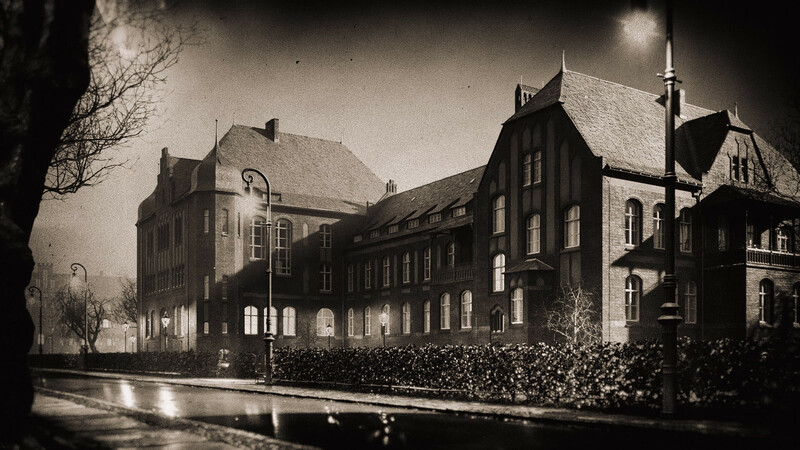 It is an actual psychiatric clinic and I always found it had a beautiful creepy Victorian Gothic vibe to it. 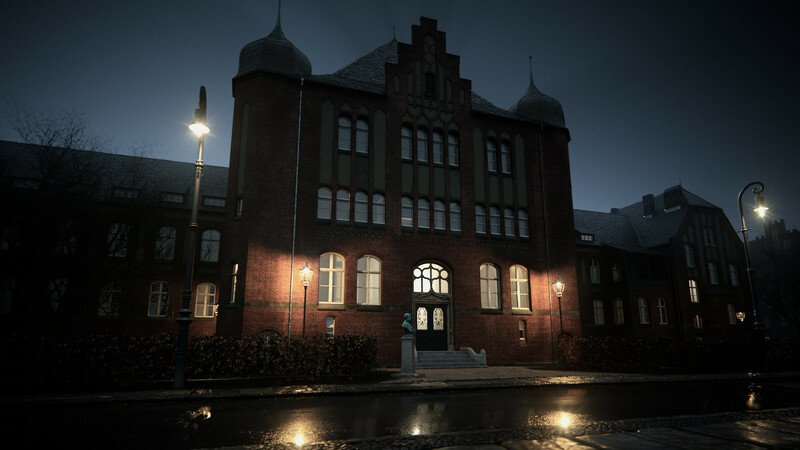 Since I couldn’t find blueprint for it, I decided to photoscan the entire building in chunks, assemble and scale the scans in Max, and use them to poly-model the asset very much as you would use tracing paper to copy a photograph. It’s a low-tech cheat, but it worked much better than using just the photographs in terms of capturing accurate proportions. Click here for a visual breakdown of the process. 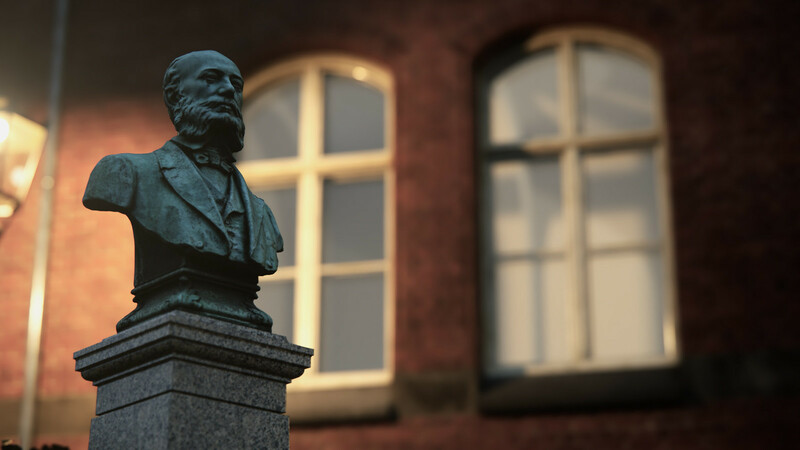 Curious how you do the large-scale 3D scanning for the building? Thanks. Since you have worked a little bit with FStorm, can you give a non-binding comparison? With the newer versions of FStorm I don’t have any vram-worries anymore (as long as you prepare your scenes a bit). Lots of high poly trees, 4k maps, cars, foliage, 3d people, displacement – using around 6gb at most. @Bobby: Thanks. Making direct comparisons is quite pointless, so I won’t get into that. But I’ve only had the latest version of FStorm for a few days and you can expect more on it in the coming weeks. @Matthew: Just like I would photoscan anything: Walking around it with my camera. Obviously, using a drone would have given a better result, but this isn’t supposed to be a high-res scan. Just a good massing model for reference. Little bit off-topic, but what Max version are you using? 2019? How is your expericence with previous releases in general? Hey @Bobby. I used Max 2018 for this one. I normally wait roughly a year before installing a new version of Max. I like 2018 a lot. It’s been very stable for me, unlike 2017, which would crash if I looked at it askance. Max 2019 runs fine. Anyone else had this problem? Autodesk has the WORST uninstaller EVER. First click your way through dozens of Autodesk program parts to uninstall and then get left with Autodesk files, folders and registry entries ALL OVER the system. @Bobby. You know the uninstaller from autodesk? it’s found in the autodesk folder in the startmenu /unistall tool… there you can unsinstalle whole packages at once. Amazing job, as always ! 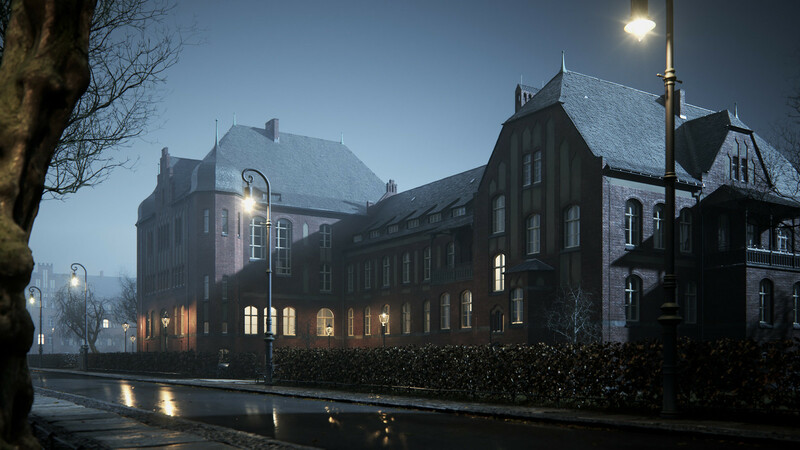 Also, V-Ray Next have been released, I would love to have this scene for learning and testing new things. Your Swedish Flat scene taught me so much of a new stuff (I am pretty much a beginner). Hey @Aerowalk. That’s the plan. 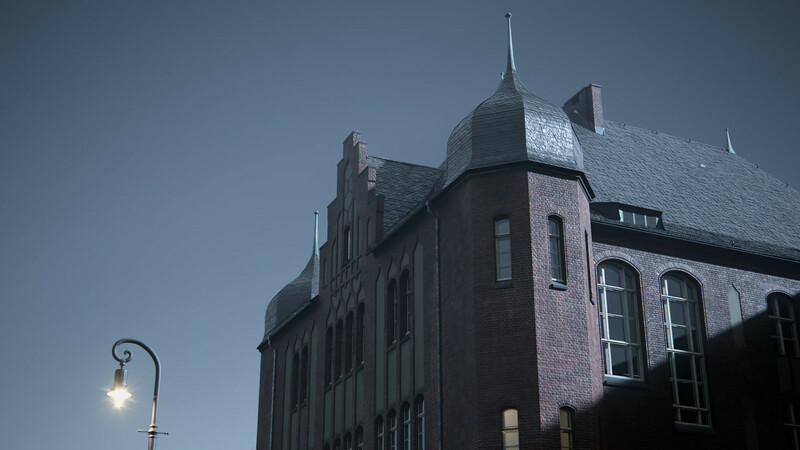 As soon as I’ve received my V-Ray Next license (ordered today), I will upload the scene to Turbosquid. Can ask you some resource o suggest to model the most fine details of your model like frames of windows, decorative friezes and colums? I know only the bases of box modeling (and 3d modelling with AutoCAD and SU) and i’ve never understood the workflow.